And I mean the Chocolate Whoppers-malted milk balls, not Burger King Whoppers. The malted milk Whoppers are one of my favorite candies, maybe it comes from eating the Robin Eggs in my Easter basket, but I love them. So when Momofuku brought Chocolate Malt Cake to the Milk Bar menu, it went on the list of things to try before it was rotated out. I was anticipating Whoppers in cake formation. 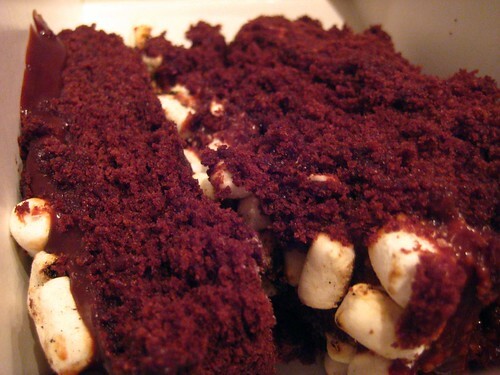 I got a dense chocolate cake with a fudgy ganache frosting with marshmallows. Top it with a graham cracker and call it a s'more. Not that it was bad, the cake was good in itself though I needed a glass of milk after two bites. The marshmallows couldn't stand up to the chocolate, and by that I mean I didn't taste them at all. It was very decadent dessert made for splitting. Maybe if switched out the marshmallows for Whoopers? It's still available if you want to try! Whoa - that looks INTENSE. Also, delicious! Glad you enjoyed it! have you tried the malted cake at Baked? I love whoppers too, and I thought the soft serve (while it was still there) was more like the candy. 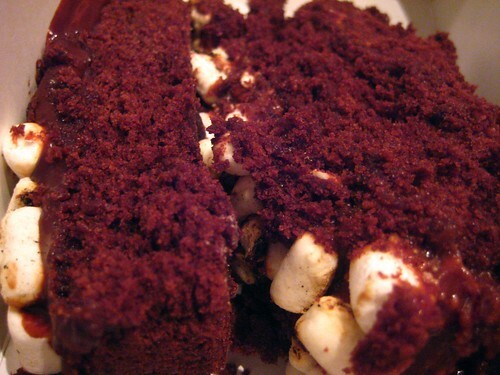 My favorite Momofuku cake is still the Banana.